It is NOT illegal to filter through traffic (travel between lanes of stationary or slow moving vehicles), but you do take on the chance of increased liability if you are involved in an accident. Any dispute would turn on how you were riding leading up to the collision, so don't hurtle up the middle of the road 20mph faster than the surrounding traffic. Instead be cautious, position yourself so other drivers can see you in their mirrors and keep an eye out for drivers letting a car out of a side road into your path. Bikes are allowed in some bus lanes around the country with Transport for London running an 18-month trial from last January on their red routes. Any bus lane that allows bikes will have a motorcycle icon on the signs at the start of the lane, so keep your eyes peeled. Helmets have been compulsory since 1973 and they should be securely fastened under the chin, be a good fit on your head and be marked with a BS6658 sticker on the outside or an EC approval mark somewhere inside. If it's fitted it must be an approved visor/goggle. It'll either have a BS4110 mark or the new EC Regulation 22 type 05 mark. A 50% tint is the darkest you're allowed by law and even then it will be marked "for daylight use only". Dark, mirrored etc. 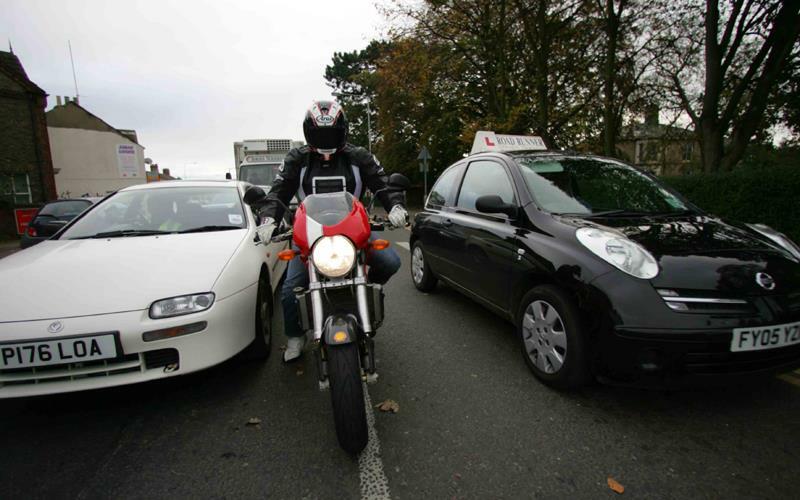 visors are illegal ­- some motorcyclists prefer to wear sunglasses instead. The grooves of the tread must be a minimum of 1mm in a continuous band across the central three quarters of the tread width of the tyre and throughout the whole of its circumference. If the grooves of the original tread pattern do not extend over three quarters of the width of the tread, which is quite common with motorcycle tyres, any groove that is a part of the original pattern must have a minimum of 1mm tread depth. You must have some pad material on the pads, no lower than the minimum mark. If pads are allowed to wear back to the metal, there will be an horrendous grinding sound every time you apply the brakes as the pads chew up the metal discs, and you won't stop quiclky enough. Check them at least every 2000 miles. If they are fitted, they must work. So watch out for blown bulbs, especially if you ride on lit roads in towns where you can see enough to get around without them. The headlight also needs to have its dip and high beams adjusted correctly (this is an MoT check).